Agrotechnomarket.com - Floriculture is the art which deals with growing of flowers and ornamental crops from the time of planting to the time of harvesting. It is a branch of Horticulture which shares out the studies of production of ornamental plants through cut flowers, seeds, bedding plants, grafting and marketing of flowers and flower produces. 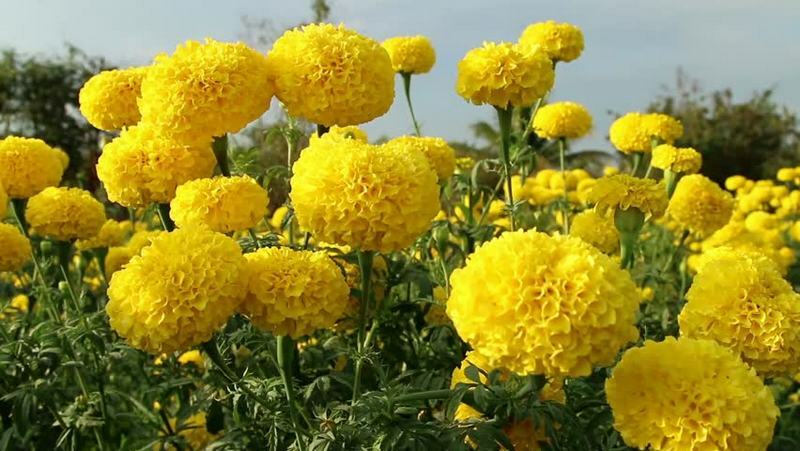 It includes cultivation of flowering and ornamental plants for sales or for use as flower wedding, bouquet, and raw materials in cosmetics, Perfume industry and also Pharmaceutical sector. 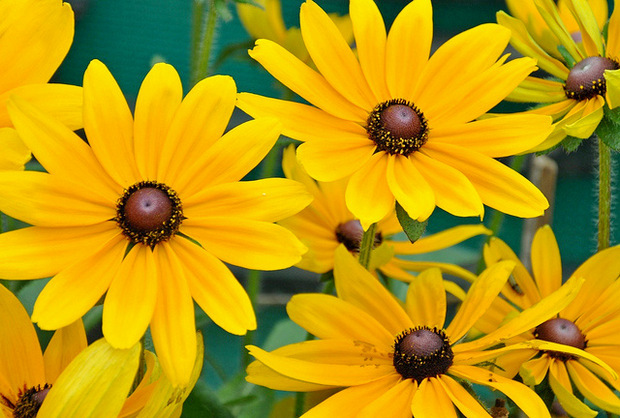 These are the list of floriculture flowers in the scientific names of flowers. Ageratum is prized for its blue flowers that available annually. 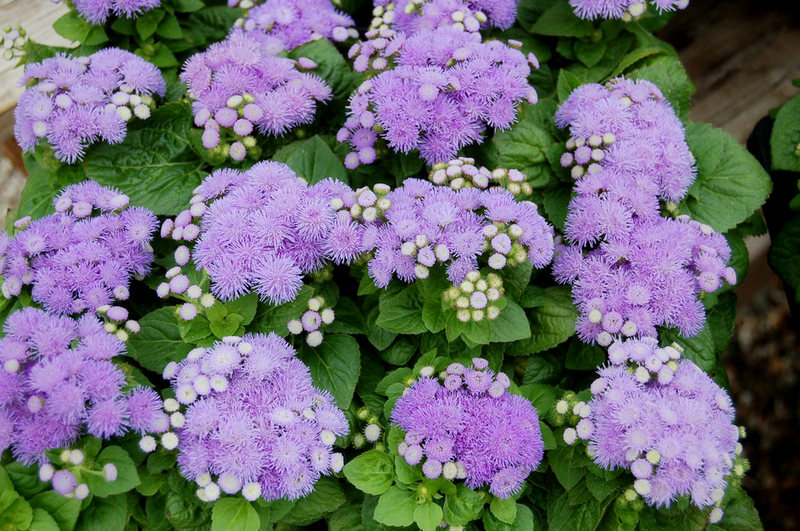 The best performs of Ageratum is in the late spring and early summer and in the early fall. Some types of Ageratum have more heat tolerance especially the vegetatively propagated varieties. Ageratum also known flossflower, a native of Mexico, is often used in formal designs that need a blue color. Ageratums offer soft, round, fluffy flowers with blue being most common. Some various shades are white or pink, and few are tall with a loose form. Its fringed, button-like flowers are very unique and provide interesting texture to your garden, even if it is partially shaded. ‘Hawaii‘ – This variety has flowers of a royal blue. 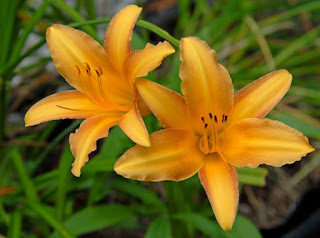 It blooms early and is one of the most long lasting of the types. ‘Blue Mink‘ – This type has blooms in a powder blue color and reaches 12 inch of height. 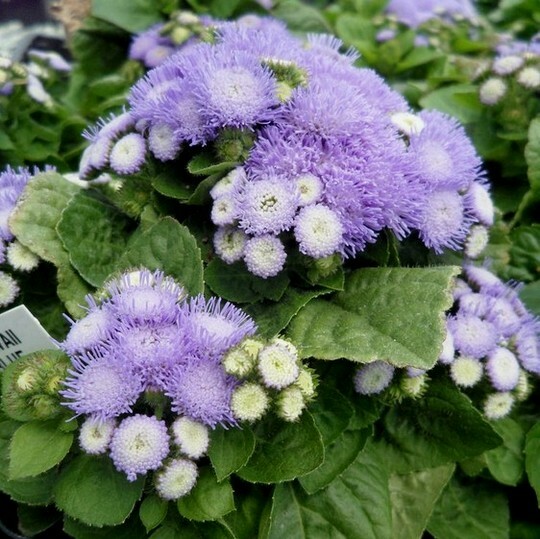 ‘Blue Danube‘ – A type of Ageratum that reaches just 6 to 8 inches and features flowers in a medium blue hues. Life Cycle: Annual reproducing from seed. Leaves: opposite, ovate, cordate base, petioled, margins crenate-serrate. Flowers: heads forming dense, nearly flat-topped, clusters of small (1/4”dia.) blue, white or pink flowers. Landscape Uses: bedding; edging; foreground; containers. 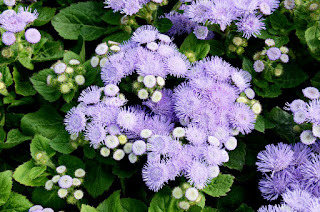 Ageratum is a good blue-flowered annual. It blooms best when the nights are cool – spring and fall. There are also tall varieties used as cut flowers. 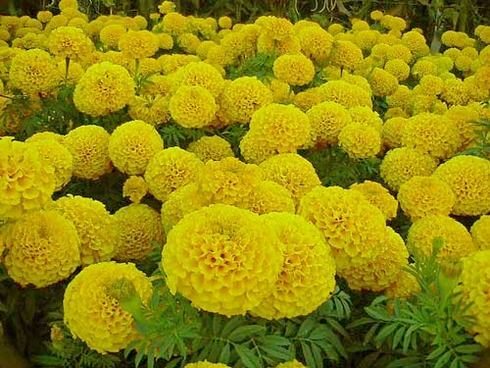 American marigolds grow up to 36 inch of height and be tall flowers, although breeding has produced shorter heights. 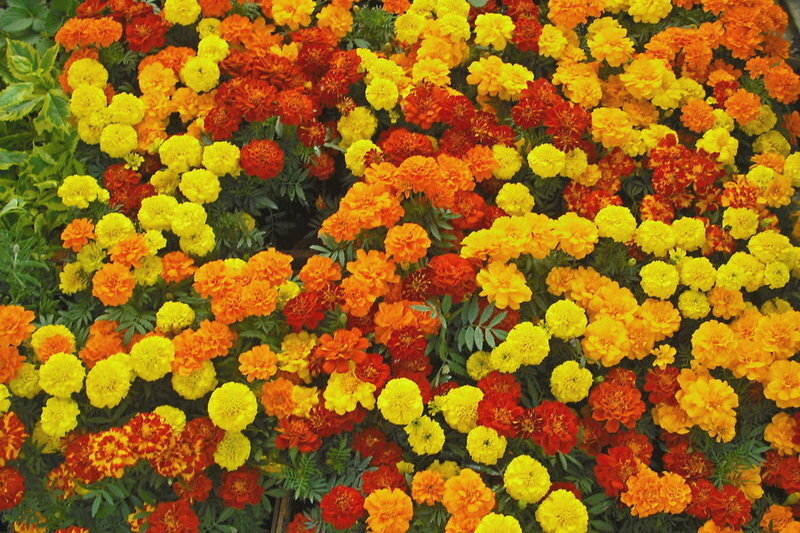 American marigolds have large, fully double blooms in yellow, gold, and orange. How to cultivate American marigold: The best growing of American marigolds is in full sun with moist, well-drained soil, although they will tolerate drier conditions. Plant them outdoors as soon as all danger of frost has passed. Space seedlings 10 to 18 inches apart. Propagating American marigold: Seeds may be sown in place. For earlier bloom start indoors 4 to 6 weeks before outdoor planting. Seeds germinate in 5 to 7 days at 65 to 75 degrees Fahrenheit. 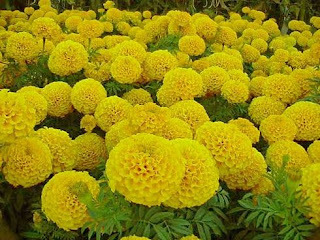 Uses for American marigold: Grow taller tagetes toward the center or rear of beds and borders, or as cultivating pockets in full sun. Mass them in front of shrubs or plants for a big splash of color. You also can use them to make a small hedge around a vegetable or herb garden. 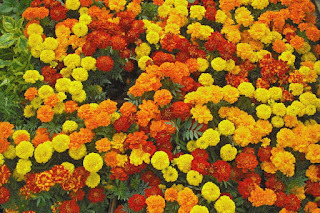 American marigolds also work in containers if kept uniformly moist. In New England, The best growing of Annual Vinca is in full sun and well-drained soil to perform well. Hot summer weather is helpful too, to get the best growth and flowering. In the South, Annual Vinca is as important for cultivating in hot, full sun locations as impatiens is for shady locations. In New England Annual Vinca often starts slow and reaches peak blooming in July and August. 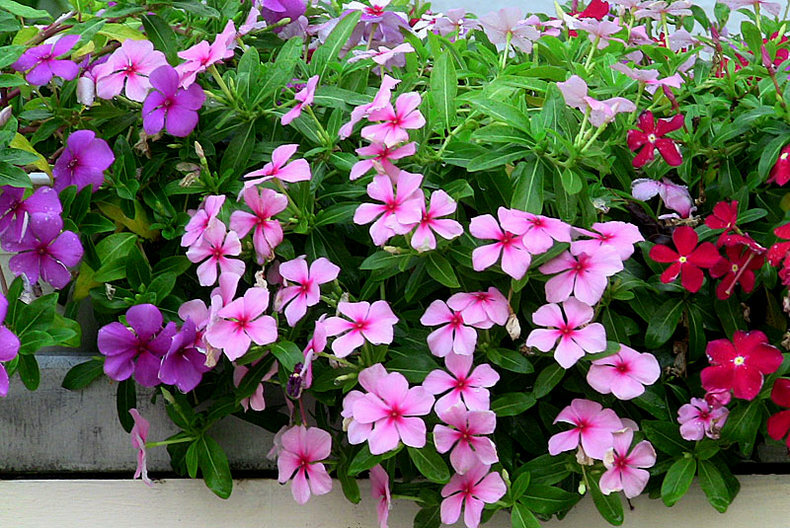 Annual Vinca is suitable for herb gardens as its extracts are used in modern medicine for some cancer diseases. 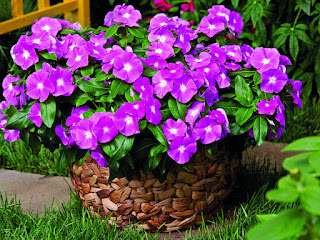 Vinca or Periwinkle should be planted in ground that has dry areas. Improper pH may increase disease problems because good soil drainage is important to prevent disease. The ideal PH is 5.4 to 5.8 to cultivate Vinca. It's easy to grow, and requires little or no attention. 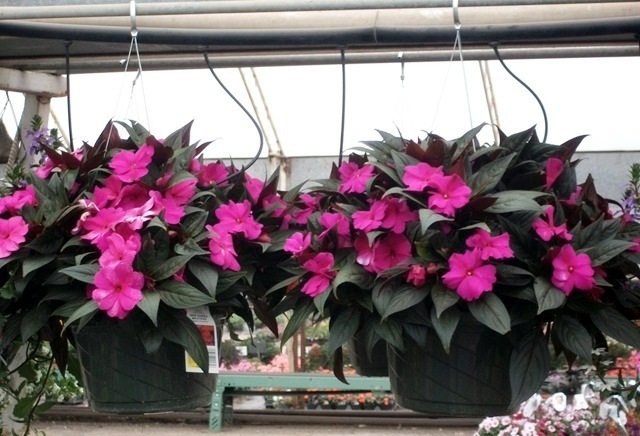 A garderner once reported that he has grown Vinca in the same location for 30 years. It successfully reseeded itself annually, with no effort on his part. 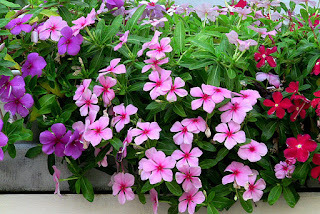 This flower is well-known by three names: Vinca, Periwinkle (or Madagascar Periwinkle), and Myrtle. Botanists will tell you that there is also a separate strain or variety of Periwinkle. Vinca plants are native to North America, Europe, China and India. 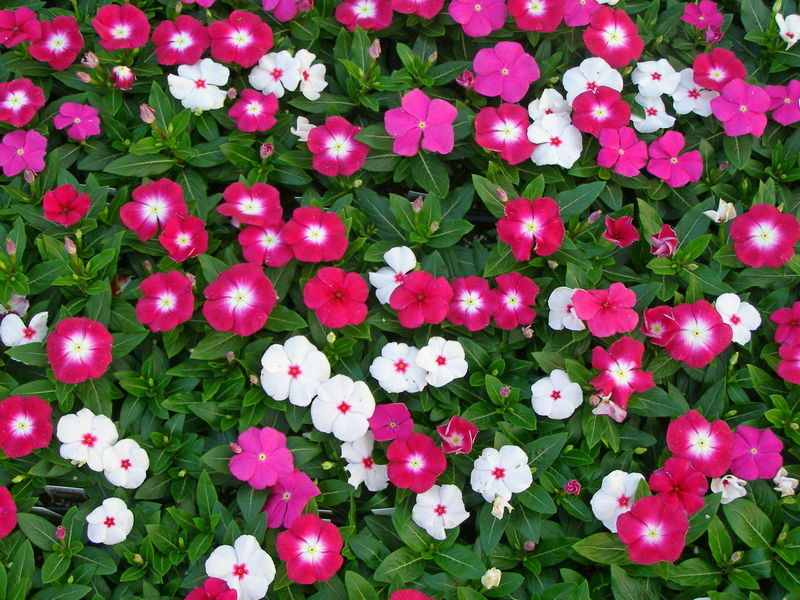 Vinca is commonly used for borders, edging, and ground cover or bedding plants. Plants grow 1-2 feet tall. 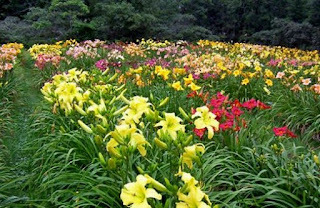 The flowers are grown for its attractive glossy, green foliage, as well as its flowers. Flowers bloom all summer, and up to frost. Common colors include white, rose, pink, and red. Vinca or Periwinkle will grow in range of light conditions, from full sun to shade. It is an easy-to-grow annual for beds, borders, edging and containers. Vinca prefers full sun, tolerates heat and drought and can be relied on to flower in the hottest weather throughout the entire summer. 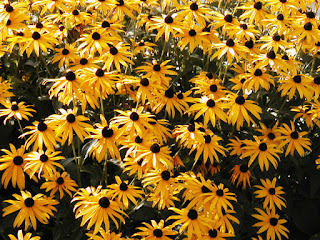 Black-eyed Susans are an old-fashioned garden plant, very popular for hot, sunny areas. Great for a burst of spring and summer color in any sunny to partial shaded area. 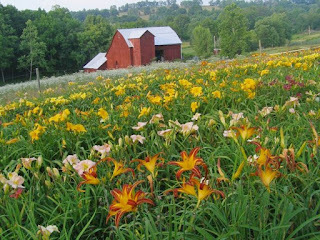 Daylillies are easy-care perennials that have earned themselves a place in any garden. The huge variety of bloom types means there is one out there for everyone! Plant Habit Growth: rounded, clumps, up to 5 feet tall. Leaves: basal, linear, keeled, 1-2 feet long, arching, may be evergreen or deciduous. 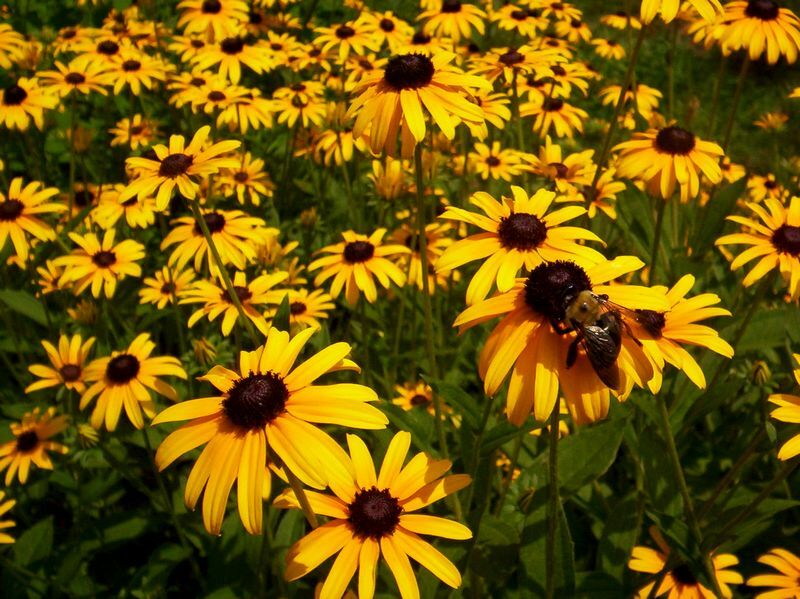 Flowers: in clusters on long scapes, shaped like funnels, 3 petals and 3 sepals; many colors and bicolors. Flowers maybe single or double. Landscape Uses: massed; naturalized; fg; mg; specimen. New Guinea impatiens (Impatiens hawkeri) produce much larger flowers than other impatiens. They’re prized by home gardeners for the colors of these blooms, which almost glow with vibrancy. New Guinea impatiens are named after their native island of New Guinea. 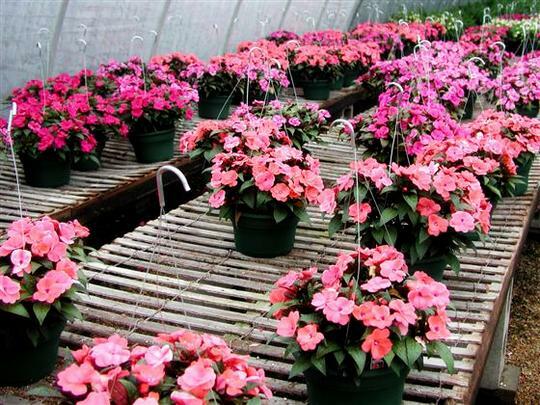 Although their initial introduction to the United States in 1970 didn’t go well, plant breeders have since created new cultivars that have made New Guinea impatiens a popular potted and landscape plant in American gardens. 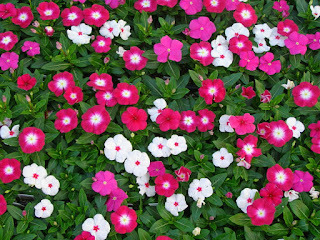 If you love the look of impatiens but your flower beds get strong sunshine for part of the day, New Guinea impatiens will fill your yard with color. 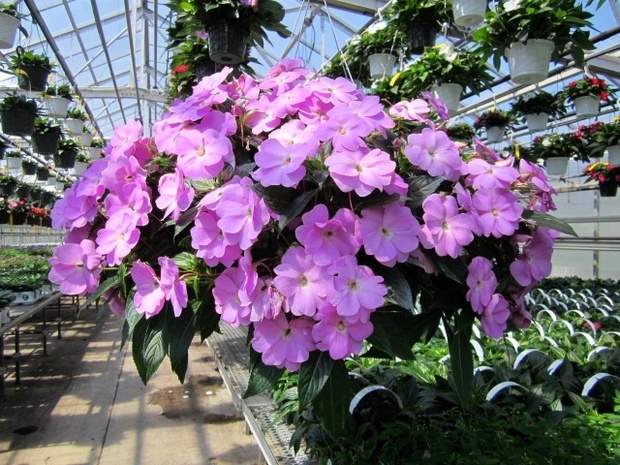 Unlike classic impatiens plants, which are shade lovers, New Guinea impatiens flowers tolerate up to half a day of sun in most parts of the country. These colorful blooms come in bright shades from lavender to orange, spanning the rainbow with a choice of bedding colors. Caring for New Guinea impatiens is no more difficult than any other flower, as long as you keep the plants well-watered throughout the hottest parts of the year. Plant Habit Growth: about 2 feet tall. Leaves: sword-shaped, with prominent midrib. Flowers: wide and flat about 6 inches. Falls are large, elliptic to ovate and beardless; standards are short, narrowly oblanceolate. Colors are white to blue, purple, reddish-purple, or lavender-pink. When you are looking for an easy-care flower that loves damp and moist conditions, then the Japanese iris (Iris ensata) is just that garderners suggest. 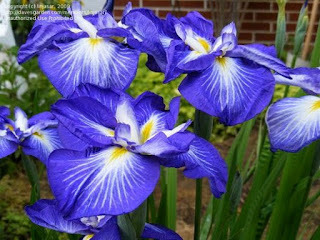 The term "Japanese iris" is the species of Irises cultivated in gardens or growing wild in Japan. 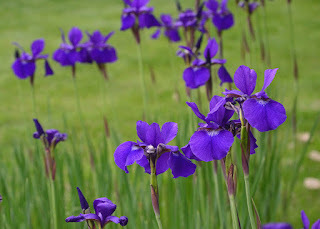 There are three species of Irises, namely hanashōbu (Iris ensata), kakitsubata (Iris laevigata) and ayame (Iris sanguinea). Of these three species, I. ensata is the one most commonly referred to as "Japanese iris" outside Japan. This flowering perennial is available in a range of colors, including purples, blues and whites, with attractive medium green foliage. Care of Japanese iris is moderately simple when the plant is located properly, namely in boggy areas, near ponds and water features or even potted and placed in these bodies of water. 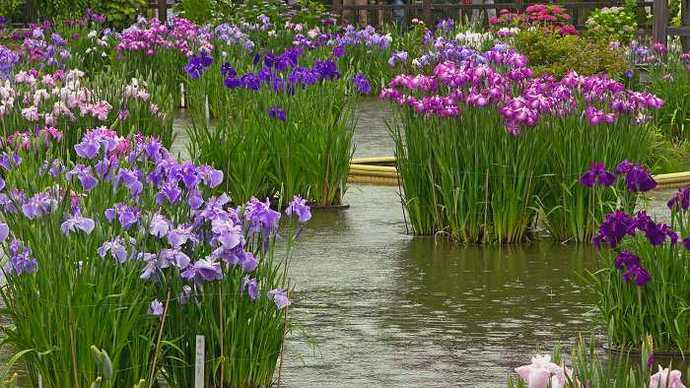 Learning when to plant Japanese irises is also an important part of their performance. Growing Japanese Iris Plants The timetable for when to plant Japanese irises may involve amending the soil with acidic, organic amendments prior to planting the rhizomes in early fall. Unlike many garden flowers, Japanese iris care does not involve planting in a well-draining soil. 0 Response to "List of Floriculture Flowers"